Reliance Industries chairman and Energy tycoon Mukesh Ambani is the richest Indian alive today, with total assets worth $18.9 billion. His younger brother Anil Ambani, chairman of Anil Dhirubhai Ambani Group is worth $7.1 billion, and has been ranked as 11th richest Indian. These findings were disclosed by Hurun Rich List, which ranks the wealthiest persons of the world. Initially started for Chinese elite, Hurun Rich List now ranks the richest persons from all over the world. The minimum qualification for entering this elite list is having net worth of $300 million, and based on this criterion, 141 Indians were found to be eligible. Last year, this list has contained only 101 Indians. The calculations for finding the net worth of the richest Indians were based on the exchange rate to US dollar as on October 18, 2013 which was Rs 61.50. The total net worth of India’s top 100 richest persons grew to $250 billion in 2013 compared to $221 billion last year. This growth has been achieved despite sliding value of Indian rupees and high inflation. Dilip Shanghvi, founder of Sun Pharmaceuticals surprised everyone as he gate crashed directly into 3rd position. His personal fortunes has increased by over 65% in the last year and stand at $13 billion as his cancer drug Doxil has witnessed unprecedented sales all over the world. Laxmi Niwas Mittal, steel tycoon based in London is ranked #2 with total assets worth $15.9 billion; which is a decline of 6% compared to last year. Another surprise entry in this list is Shahrukh Khan, the Bollywood superstar and co-owner of IPL team KKR and Red Chillies Entertainment. With total net worth of $400 million, he has been ranked at #114. Among women, Savitri Jindal is the richest Indian, with total assets worth $5.1 billion. She is the non-executive chairperson of OP Jindal Group, which manufacturer steel. She is followed by Indu Jain, chairperson of India’s largest media group Bennett, Coleman & Company. She is having personal net worth $1.9 billion. She is followed by Anu Aga, Kiran Mazumdar-Shaw and Shobhana Bhartia ranked 3rd, 4th and 5th. Overall, women constitute only 4% of the overall rich list. 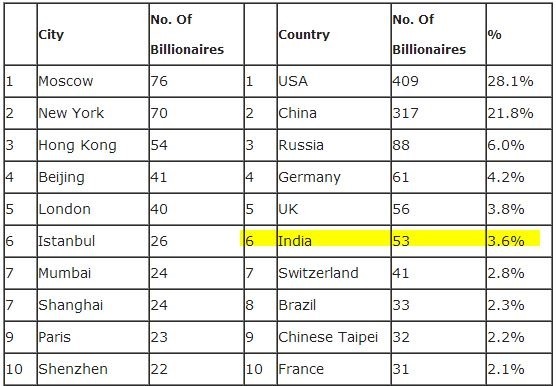 – Most of the India’s richest persons live in Mumbai. Out of top 100, 36 reside in Mumbai, whereas 22 of them reside in Delhi and 15 in Bangalore. – 9% of all Richest Indians live abroad. – Manufacturing is the industry which has the most of the richest persons, closely followed by Pharmaceuticals, Real Estate, Infrastructure and Energy. Indian Radix Registry Wins .Website gTLD! Writing the below just for chatting sake. At least Russian mafia billionaires (the non-oil Czars) have found a “way of declaring their wealth” and joining the list of global elite. If the non official Indian Billionaires (who made their fortune by “other means”) find such ways, India will have 100 times more Billionaires. Or if put in other words, the surveys should list two types of Billionaires. White Billionaires and Black Billionaires. 1) Out of total 88 Russian Billionaires, 76 live in Moscow. It strengthens the theory that Russian wealth is in the hands of very few aggressive, well connected mafia.